There is no need to go thourgh our store for custom orders. To purchase a ring from our inventory please visit our STORE. If you don't find the ring in your style or size on our STORE site then please contact us and we will be happy to craft a custom ring for you with the coin of your choice. Just let us know what you would like and we will contact you with the details. Our prices are fairly consistent. However, some coins may cost a little more depending on the type of coin, date and availability. We also offer a quantity price break for merchants. Please contact us with your request and we will do what we can to provide you with your needs. If for any reason you are not completely satisfied with your purchase just return the ring within 7 days and we will make an exchange or refund your money less S&H. We want you to be happy with your purchase. Most of our rings are made with US silver coins.Each size of coin has an upper and lower finger size limit. For small sizes, apx 4 1/2 - 8, we use silver Washington and Barber quarters. 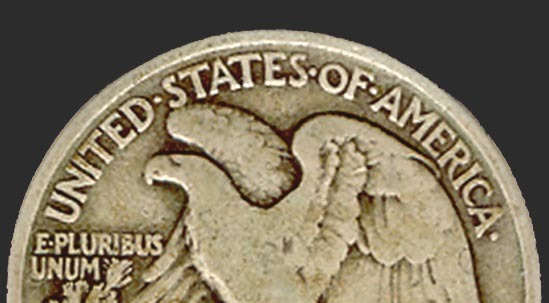 For the larger sizes, apx 8 - 14, we use Barber, Walking Liberty, Franklin and 1964 Kennedy half dollars. Silver dollars cover sizes 14 - 19. We also make custom rings on request for certain types of coins or dates, ie: birth year, anniversary, ect. The larger we make a ring using any given size of coin the flatter the band will be. The smaller we make a ring, using the same size of coin, the more rounded or dome shaped it will be. PLEASE NOTE: Due to the nature of crafting these rings out of coins one rim of the ring may seem to be a little larger in diameter than the other rim on the inside. There is always a taper associated with coin rings. The taper will either show up on the outside of the ring, or on the inside. This is due to the reeded edge of the coin being thicker than the center of the coin, which becomes one end of the ring when it is finished. Rather than end up with the taper on the outside, where it would diminish the appearance of the ring, we choose to raise the (thin) edge of the rim and leave the taper on the inside. When we measure the ring we go by the end of the ring with the smallest diameter to determine the size. The other end of the ring will be a slightly larger size. Note: Many of our coin rings are made using Circulated Silver Coins. Because they are circulated some may have bumps, nicks and scratches. 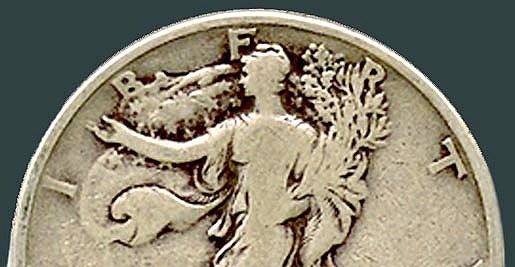 Although we try to pick coins that will make good quality rings please be aware that there may be a few minor character flaws in the ring because of this.We sometimes use uncirculated coins which will not have these character flaws.